And “Referral Sites” in the ecosystem framework are a superset of influential third-party sites that can also include industry analysts and academic websites. But while the WPO model focuses primarily on driving new website visitors, the ecosystem model extends further by incorporating conversion rate optimization (CRO) and “post-CRM” (lead scoring, lead nurturing, and sales followup) processes as well. Develop new ways to improve and scale your current campaign. 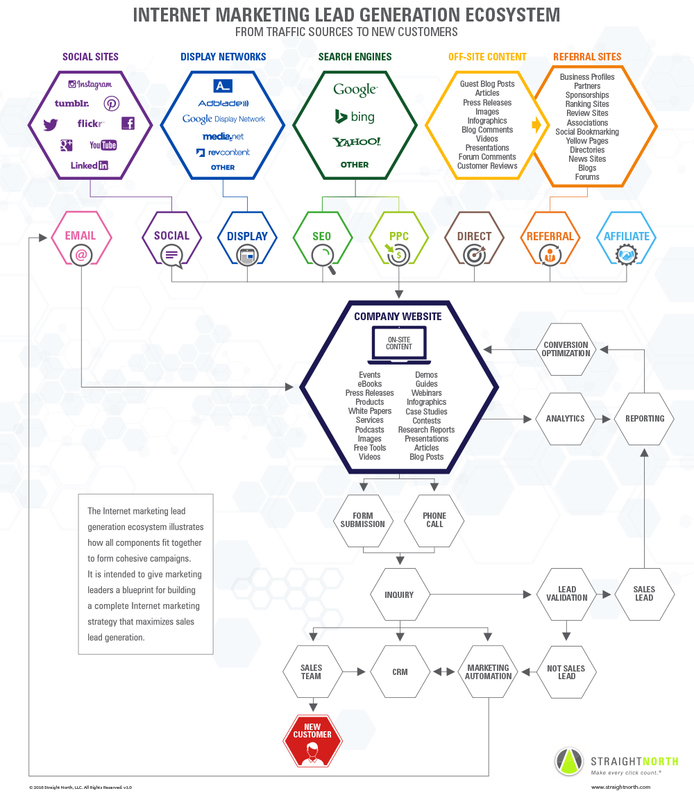 The top row of hexagons show the numerous online outlets that can be used to drive traffic to your website. The middle section of hexagons highlights the reporting, contacting and lead validation process, which should be managed by more experienced internet marketers. And, the bottom portion of the infographic shows the leads collected become a new customer. Brad Shorr, director of content strategy at Straight North, contributed to this post.